Turns out, that's a possibility for folks like me. 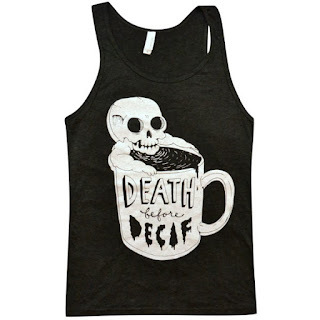 Turns out, I don't much care to be a skeleton in a coffee cup. As I sat in my doctor's office, he told me that Starbucks made a decaf that was actually very good. "You won't know the difference," he assured me. Lucky for me, Roger has a second job at Starbucks. That night, he brought me home a pound of Pike's Peak Decaf and a pour over ceramic. And friends, it was heaven. I tasted like coffee. It tasted like Jesus made it for me with His own two hands. It was hot, welcoming, and jitter free. I am now willing to wager that my decaf coffee is better than the coffee I had before that often left me so jittery that my hands refused to do a thing for me. So, to all you caffeinated coffee snobs, I am telling you right now, you're pretending. Your love for coffee is fake. You only THINK you love coffee. Because when you can find it within your loving, open heart to embrace the disfranchised, the coffee that suffers so much harsh criticism and judgement, then you are true lover of coffee. My love for coffee is pure and true. Coffee and I have faced our struggle and won the battle. We are still one, coffee and I. Forever and always.